The younger generations may not know this, but before founding his own PDB Racing team, the Dutchman Peter de Bruijn was a great champion and a talented technician. In a distinguished career include his European Championship and the World Championship 1980 at Nivelles against Ayrton Senna, among many other successes. Fascinated from a young age by the technology, he produced his own chassis in the 70s, later collaborated with Swiss Hutless then CRG, including the creation of Maxter engines, and was involved in the successes of Danilo Rossi, Jos Verstappen, Alessandro Manetti and of course Lotta Hellberg, 4th in the World Championship at Le Mans in 1991 in FK, the best female result to date. Kimi Raikkonen was part of the PDB Racing team, finishing second in the European Championship on Gillard chassis. 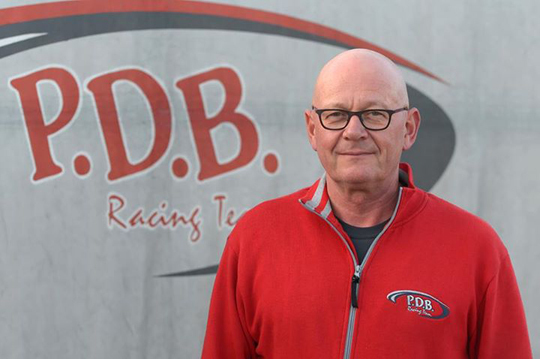 In addition to his qualities as a driver, technician and team manager, Peter de Bruijn is one of the most engaging personalities in the world of karting. "For several reasons, the golden age of karting is behind us," said Peter de Bruijn. "Everyone recognizes that the economic situation is not brilliant, but I also think that attitudes changed at the start of the 2000s. In the early days and into the 90s, drivers drove almost every weekend, rain or shine, because they were passionate about it and it was not very expensive. With a mechanic, often a friend or family member, you could do it if you were not afraid of getting your hands dirty! Nowadays, drivers want comfort, beautiful awnings, professional mechanics, an attentive staff. A taste for effort has disappeared, while the services have become more expensive. That's life! "PDB Racing recently started competing in the brand challenges like Rotax or X30. We are no longer able to find enough drivers to support our team in high level competitions. People think one-make categories are cheaper and easier, but this is not necessarily reality. They are attracted by the one-off international or world events, rather than by regional or national races all throughout the season. "It is unclear if today's drivers are as good as those of the past because there are many different categories, so comparing talent is not easy. But I am convinced that early transition to cars for top prospects has consequences on the general level. The case of Max Verstappen is an exception, but I remember when Kimi Raikkonen was with us, he was not fantastic at 16. He became very good at 18. It was the same for Fernando Alonso and others."